They’re really no big deal, but they are quite tasty. A simple cookie, made from simple ingredients that most of us always have available in our pantry. it doesn’t have to be a long, drawn out, adventure that requires 30 ingredients and five hours of my time. The simple things in life are enjoyable too! Place a piece of waxed paper on the counter. In a medium saucepan add the sugar, cocoa, butter, and milk. While stirring, bring to a boil and allow to boil for 1 minute. Remove from heat. Add peanut butter and stir until combined. Add vanilla and oats and combine thoroughly. Working quickly, drop mixture by the spoonful onto waxed paper and allow to cool. Well, call me Cheetah! These look soo good and having both chocolate and peanut butter in them, I’d better have people to give them to or I’ll eat the whole batch in an evening. 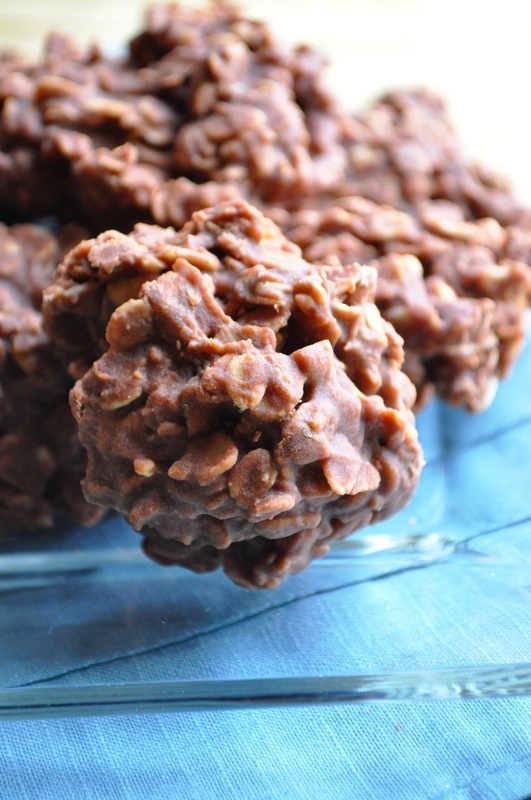 I love no-bake cookies.. they’re actually one of my favorites.. I love your version of them! Nice! I’ve actually never made no-bake cookies before, but I’m excited to try it! I’m glad that you liked one of my comments. My daughter was a celiac baby and became a colitis sufferer as a teen. She is an adult and still living with the problem. I have been trying for years to tell her doctor about her condition as a baby. Mothers never know the right thing, but recently she did mention it to him and thought that a gluten free life might not be a bad thing to try. She seems to have responded to it in a very good way. I will be following you and hopefully, I will get her to do it too.